In what is the largest government intervention in Afghanistan since the turn to market economy, the Central Bank of Afghanistan took over the management of the largest private bank in the country. The move is meant to prevent the collapse of the troubled bank that lies at the heart of the Afghan financial system. The Kabul Bank, after months of rumor and speculations, is officially in trouble. Its top two executives—both also the largest shareholders of the bank—have been forced to resign, with a management team from the Central Bank moving in to take charge. Less publicly, Kabul Bank’s boss has been handing out far bigger prizes to his country’s U.S.-backed ruling elite: multimillion-dollar loans for the purchase of luxury villas in Dubai by members of President Hamid Karzai’s family, his government and his supporters. In an interview with the New York Times yesterday, Khalilulah Frozi, the ousted Chief Executive and one of the largest shareholders, admitted to the crooked investment of the Bank in Dubai real estate. The biggest mistake, he said, was the decision by his partner, Mr. Farnood, to buy $160 million worth of villas and office buildings in Dubai, in the United Arab Emirates, at the height of the real estate bubble in 2007. And of course, the troubles of Dubai real estate are known now. The investment, along with offering of large loans to friends and family has put Kabul Bank, and the Afghan financial system, in serious trouble. 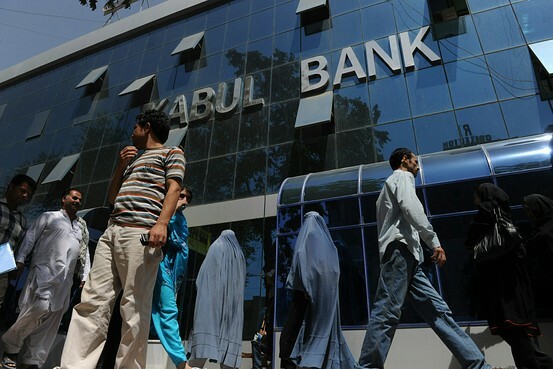 "Kabul Bank, a bank for everyone," their slogans say. The collapse of Kabul Bank would not only create a mayhem for 250,000 government employees who receive their salaries through the bank, but it will also spread a culture of mistrust towards banks amongst the average Afghan. If the withdrawal of $180 million dollars in the past two days is any indication, the trust built in the past few years has been thrown out of the window. For, this will not be the first time Afghans see such troubles. They have been bitten by this snake once before, and they certainly fear this rope that progressively looks like another snake. Towards the middle of the 20th century, Afghanistan was developing a decent economic system. Banks played a major role in people lives. Families opened savings accounts. A young mortgage system made it possible for civil servants to afford a house. The middle class was thriving. But in the 1990s, it all collapsed along with the communist regime. As the Mujahideen moved in to capture Kabul, the banks closed down. People’s life savings were lost within days. Bank deposits have never been guaranteed by governments in Afghanistan– not that there was much of a government in those days anyway. Just like many other of their complaints, the people had no one to turn to on this one. They just had to shut up and take it. Today, those one million clients are losing their trust in the bank. With it, the trust in the banking system at large is also at risk. Afghans are fearful of any kind of turmoil. In the past few years, some have managed to better their lives, to open a savings. Today, when that also seems at risk, one can’t blame them for any kind of reaction. Ands lets not forget that a big part of Kabul Banks clients are armed. The Afghan Army and police, to my knowledge, receive their salaries through the Kabul Bank. If they feel any loss of their savings, one has to worry about the security situation. Also, is Kabul Bank the only one of many private banks in trouble? The Washington Post article from February briefly mentioned that Mirwais Azizi, the founder of Azizi Bank, had also invested large sums in Dubai. Is Azizi Bank next? “America could support Kabul Bank to the last penny, of course that would help,” he said in an interview at his Kabul home. “The full faith and credit of the U.S. government behind Kabul Bank—what more do you want? What exactly does Mahmoud Karzai think the US government is? a mop to clean after them as they keep screwing up? It is beyond my comprehension as to how Mr. Karzai could bring himself to utter those pleas and still maintain an ounce of pride and dignity. This entry was posted on Friday, September 3rd, 2010 at 8:18 pm	and tagged with Afghan War, Afghanistan, Bank, Economic Crisis, Kabul, Kabul Bank, Karzai, War and posted in News and Politics. You can follow any responses to this entry through the RSS 2.0 feed.